Are you planning a first-time trip to Orlando? Let Falcon Charter Bus Orlando assist in your travel plans! 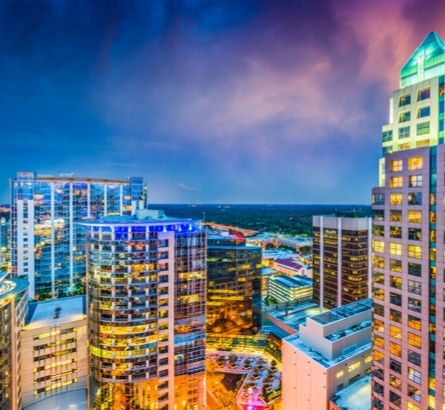 As one of the busiest tourist cities in the country, Orlando has an endless number of things to do for all types of travelers. From family-friendly theme parks to vacation resorts to bustling nightlife, there’s so much to experience. Plan your trip for a weekend or even an extended vacation with private transportation provided by Falcon Charter Bus. Call us at 407-274-9808 to chat with a rental expert about your next trip to Orlando. Orlando is the perfect vacation or day-trip location for groups of all types. Whether you’re traveling to a theme park for a school field trip or family reunion, we’ll find the best charter bus to meet everyone’s travel needs. We also specialize in group trips for weddings, business trips, and sporting events. No matter your reason for visiting Orlando, we’ll ensure you comfortably arrive to each location on your trip. A private charter bus or minibus will allow your entire group to travel together without the worry of someone getting lost in an unfamiliar city. When you book your bus, you can choose from various comfortable models for your Orlando trip. A full-sized motorcoach is best suited for large groups of up to 56 passengers in need of spacious travel accommodations. There are also multiple models of minibuses in our network which are best suited for relatively small groups ranging from 18 passengers to 25 passengers. You can even request additional amenities on certain models of bus to maximize comfort during your travels. Depending on the model of bus, you can choose from amenities like WiFi, reclining seats, climate-controlled interiors, televisions with DVD players, and more. Don’t stress the transportation portion of your Orlando trip. We’ll take care of your private us needs so you can focus on planning the rest of your trip. Theme parks often have affiliated lodging and resort options that travelers can choose from. Groups looking to stay in proximity to the theme parks can explore over 30 Disney World resort and hotel options, while Universal Orlando has around half a dozen to choose from. Travel groups looking to stay outside of park resorts can find a diverse array of affordable or luxury hotel options in the Orlando area. Wherever you plan to lodge, your professional bus driver can shuttle everyone to theme parks, restaurants, and other attractions in the area. It’s important to plan ahead and give your group enough time to explore Orlando and its theme parks. Whether you’re planning to visit one park or multiple, it’s usually a good rule of thumb to reserve half a day to at least a full day at each park. Both Disney World and Universal Orlando contain multiple parks, meaning park-hopper tickets and passes a great option for groups who have extra time and want to fully experience the magic. As the quintessential and classic Walt Disney World theme park, Magic Kingdom has rides and thrills for visitors of all ages. Magic Kingdom is home to the iconic Cinderella Castle, the Disney Princesses, Space Mountain, Haunted Mansion, and various other attractions. Disney’s Animal Kingdom is beyond just a zoo! The park “celebrates all living things” and is home to one of Disney's newest attractions -- Pandora, the World of Avatar. Enjoy magical inspiration from Avatar, Lion King, and more. The Universal Orlando Resort and its parks are perfect for children of all ages as well as adults. Older teens can appreciate rides like Transformers in 3-D and Hollywood Rip Ride Rockit roller coaster. Universal is also home to one half of The Wizarding World of Harry Potter, including Diagon Alley and part of the Hogwarts Express. As the other major portion of Universal Orlando Resort, Islands of Adventure contains Hogsmeade from The Wizarding World of Harry Potter, The Hulk roller coaster, and more. If your group wants the full Harry Potter experience, be sure to buy a 2-park pass! SeaWorld offers an up-close look at aquatic wildlife, as well as fun rides and shows. The park offers multiple roller coasters and rides for older children and adults, along with interactive and educational experiences for younger children. This aquatic theme park is also an all-inclusive resort that allows visitors to swim with dolphins and directly interact with other animals. Explore underwater coral reef habitats and tropical beaches within the comfort of this Orlando resort. If your travel group wants something other than the typical theme park experience, Orlando has other family-friendly attractions to offer. Some of these attractions are located in neighboring cities, but are well worth the travel for some extra fun or even peace and quiet from Orlando tourist traps. With your private charter bus and professional driver, getting to these destinations is easy! Sit back and relax while your entire group is shuttled to nearby Merritt Island and Lake Wales. This attraction is a unique Florida experience, showcasing and preserving some of the state’s native wildlife. Get up close and personal with alligators, panthers, and more. ICON Orlando 360 is a multi-faceted attraction that includes an observation ferris wheel, theme park rides, Madame Tussauds wax museum, an arcade, restaurants, and more. Located south of Orlando, Bok Tower Gardens offers year-round views of beautiful flowers and architecture as well as weekly events and educational programs. The Kennedy Space Center and Visitor Complex give visitors an experience that can only be found in a handful of places in the country. Explore space shuttles, tour a NASA facility and even meet an experienced astronaut! Orlando is a major tourist destination for groups but finding a restaurant to accommodate a large group can still be tricky. Many restaurants in the theme park resorts can easily accommodate large groups. Whether you choose a restaurant in the theme parks or in the heart of Orlando, your charter bus driver will traverse the roads and get everyone to dinner safely. Be sure to call ahead to reserve a table or even inquire about private dining room options for your group. Orlando isn’t just a city for children to have fun. Adults can enjoy a night out on the town in downtown Orlando or in the theme park resorts. Enjoy a laid-back lounge or go out for some dancing on the town at live music bars. With a private charter bus or minibus, your group won't need to worry about designating a driver to drive everyone between locations. We’ll be your designated driver for the night. Don’t hesitate to reserve your charter bus rental today. National Charter Bus has access to thousands of buses across the country to safely transport you and your group to Orlando. Travel from destinations like Miami, Tampa, Atlanta, and beyond. We’ll get your group in the perfect motorcoach to ensure you comfortably travel throughout your entire trip. Call us today at 407-274-9808 to receive a free, personalized quote. Our rental experts are on standby 24/7 to assist you.